Gold and Silver have emerged in the last 12 months as the dominant asset group. They led the entire 2000 decade, still gathering disrespect. They do not require respect from the Wall Street and London crowd. They serve as effective protection during the slow motion crumbling process to the global monetary system. The sovereign bond crisis has circled the peripheral nations, rendered its wreckage, and is working toward the center where the USTBond and UKGilt reside (worried). Italy and Spain are squarely in the crosshairs for financial assaults, but France and the United States lie closer to the core of Western nation sacred debt territory, soon to become sacred burial grounds. That must sound drastic and melodramatic, but just wait. Other calls of an insolvent US banking system, calls of a chronic housing bear market also once sounded extreme. They came true. So did $1000 gold and Canadian Dollar parity calls made in 2005. Again they came true. Dismissal of Green Shoots, Jobless Recovery, Exit Strategy, and No QE sounded bombastic and pedagogical, but they were also correct calls. In fact, very easy calls. The ruin of the USTreasury Bond debt security is a long drawn out process like a cancer victim. Weakness is followed by emaciation, then organ damage, circulatory problems, finally a bedridden state, and lastly the inevitable death. Analogies to each can be made with USTBonds nowadays, like the foreign central banks withdrawing from the process evident in low Indirect Bids, like dependence upon debt monetization. provides the required demand to conceal $1 trillion in Wall Street firm naked shorting of USTreasurys (called innocuously Failures to Deliver) which generates desperate liquidity at a time when investment banking has dried up, essentially closing the loop on USTBond counterfeit. The net effect of the intensive Interest Rate Swap activity is to destroy capital, to drain capital from the USEconomy, and to crowd out the corporate bond market. The United States is becoming 1990 Japan, but without the trade surplus. With ignorance, the financial media has been displaying the "Turning Japanese" rock music song by The Vapors from the 1980s. Little do they realize that the expression means coming to climax during the sexual experience, with a facial expression straining to resemble the Asian countenance. How strange!! Ironically, the effect of the IRSwap usage has kept interest rates artificially low. That is the sentinel signal for the Gold Bull Market, powered by cheap money, in the quest for true safe haven in the strong storm and deep distortions. The prevailing interest rate is far below the rate of price inflation. So the Gold market will remain steadily stuck in powerful bull market mode. The banker index is finally under stress. They have benefited greatly from the fantasy of phony accounting practices. They have also benefited from a staged controlled USTreasury Carry Trade. But their losses continue to mount in great volume. Their exposure to Europe sovereign debt, the US housing market, and mortgage bond investor lawsuits combine to make renewed risk. These insolvent zombies are due for a death experience, if only the markets were fair. Mining stocks are not keeping pace with the bullion metal. The ultimate problem is paper securities and the trust held in them. Persistent stories about well supplied hedge funds shorting mining stocks, stories of naked shorting of small mining stocks (see Alpha Group), and other sponsored spread trades to support bullion metal over the mining stocks have all contributed to the decline in shares. The distrust in all things paper, as in financial securities, at a time when trust in sovereign debt is on the wane, when financial sector insolvency is argued, when bond fraud has gone unprosecuted, has created a hostile climate for investments. The shortage of credit and capital to anything except USTreasury debt has exacerbated the condition. 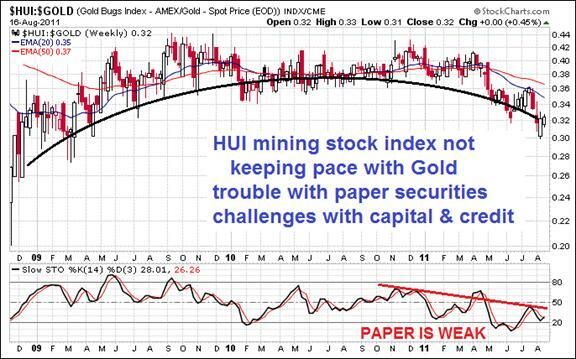 The HUI index of mining stocks has not done well versus the basic precious metal, the gold bullion, since the spring months. The threat of USEconomic recession will only make the situation worse, certain to lead to more whacks to the equity markets. Gold bullion has no counter-party risk, no paper dependence. 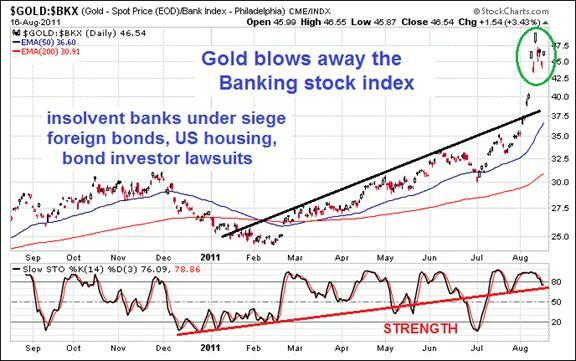 Stay clear of the fraudulent custodians and their GLD & SLV fraud-strewn funds for lazy investors who do no research. They will be separated from their metal claims, handed cash in redemption, and sent away. One point of fraud proof is that GLD & SLV have a discount to the metal, while legitimate funds like the Sprott Trust and Central Exchange Fund include a premium price to the metal. That is because the big cartel banks, as custodians, are shorting shares of GLD & SLV, sending the metal inventory to the COMEX to satisfy delivery needs. Independent analyst Dan Norcini does stellar outstanding work. Once gain, he exposed an excellent factor, this regarding Silver. He points out how the Continuous Commodity Index (CCI) has averaged one big drop per month for the past five months. 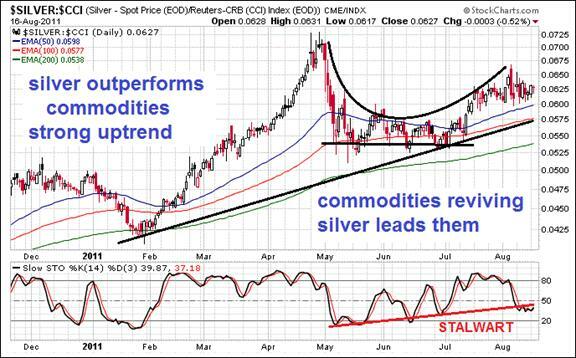 Silver has done well relative to the commodities, as he highlights. In fact, the Silver price is due to rebound. The process has begun, with Silver back above $40/oz. Each CCI drop has lasted from 4 to 7 trading days and has been followed by a rather significant rally. In the past couple weeks, the current decline seems to have run its course. The next 2 to 4 week rally in all of the commodities is underway, like a cycle. To be sure, copper, crude and the grains are going to rally. Norcini surmised (correctly) that Silver was not going much lower, if at all. He posted a reasonable target for Silver at $44 with timing before Labor Day in early September. Adding to the ammunition are the promising Open Interest numbers in silver futures contracts. Even the Large Commercials are covering their shorts in Gold, a good sign generally for precious metals. See the Norcini weblog where he argues how the USDollar will be sacrificed for the greater good. The consolidation phase for Silver has given compromised critics and lousy analysts an opportunity to denigrate the white metal, claiming it is exposed for its vulnerability as an industrial metal. While some significant portion of Silver demand comes from industrial processes, it is not replaceable. Besides, its investment demand has been equal in US$ volume as Gold demand, a remarkable fact pointed out by sector leaders Eric Sprott and James Turk. They argue that the Silver price will move higher and reduce the Gold / Silver ratio in the process naturally. 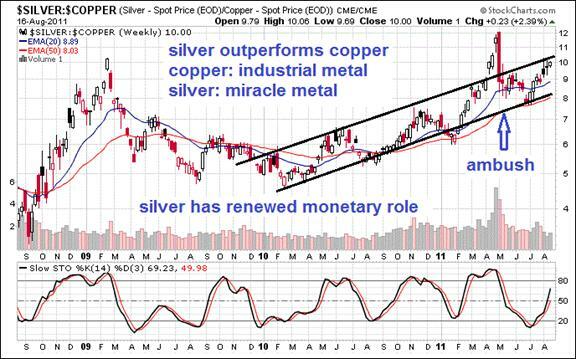 The true industrial metal indicator is copper, not silver. Copper has earned the title of having a PhD in Economics. Notice how silver has outpaced the copper price in the last 18 months. Even post-May when the COMEX ambush occurred with successive margin requirement hikes, the Silver / Copper ratio has risen steadily. Sorry, the industrial argument is a weak angle that does not bear weight or scrutiny. The Silver investment demand is due to a big important recognition that Silver is in the process of resuming and reclaiming its monetary role. The Chinese lead in that parade, adding silver to their reserves in management of their $3.2 trillion reserves booty. The gold market breakout has made history, exceeding the $1800 level before the usual games were played. The higher COMEX margin requirement is a tired card at a tilted table. Look for gold profits to move toward silver positions, lifting its price toward $50 in the coming several weeks. Lastly, one must wonder why the USTreasury Bond futures contract does not have to endure margin requirement increases. It is clearly the biggest asset bubble in existence. However, it is the standard bearer of the fiat paper charade. Its low yield is proof positive of being broken, just like Greece with its high yield. The USTreasury Bond complex would be in big trouble if not for the Interest Rate Swap and the US$ Printing Press both. Prepare to protect your personal wealth during the grandest transfer of wealth in modern history, from toxic paper to reliable hard metal with no counter-party risk. Money is in the process of being invalidated and redefined. The Paradigm Shift continues at work.